Lloyds TSB the British banking group has launched an animated TV advert to support its sponsorship of the 2012 Olympic Game, continuing with the longstanding “For the Journey” campaign of animated television commercials. The advert shows animated torchbearers running and passing the torch to one another, with the strapline, “Bringing London 2012 closer to you.” Customers are informed that they still have the chance to win London 2012 tickets through the bank’s giveaway. Music is a “new Olympic-themed” version of ‘Eliza Aria’, the theme tune from previous Lloyds TSB TV ads. The London 2012 campaign spans TV, radio, magazine and digital (lloydstsblondon2012.co.uk), and regional media partnerships with Trinity Mirror Group and Global Radio’s Heart FM network. 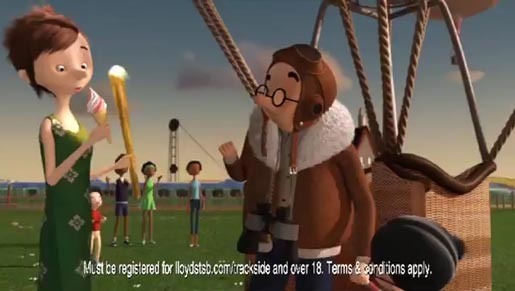 The Lloyds TSB For the Journey campaign was developed at RKCR/Y&R, London. Animation was produced by director and designer Marc Craste at Studio AKA, London. Music, Eliza’s Aria by Elena Kats-Chernin, was licensed by Leland Music. Other videos include Telephone Banking, Mortgage, Safest and Trusted, Mobile Banking Account Limit, Free Mobile Banking, Burglary, Kiki and the Yak, Plus Current Account, Bank Manager, Finance Health Specialist, Most Trusted Bank, Bank Account Overdraft, ISA, How Lloyds TSB, Airmiles, Saturday Opening, Tax Year, Cash ISA, Loans and Money Manager.